Nepal Academy of Science and Technology (NAST), under the leadership of former Institute of Engineering (IOE) Dean prof. Dr. Jiba Raj Pokharel signed an agreement with Kyutech on Nov 21, 2017, to start up plans for the launch of the country’s first satellite. The project is being led by Kyushu Institute of Technology in Japan and involves students from Sri Lanka, Bhutan, Nepal and Japan. The BIRDS 3, is an ambitious and elaborate project that helps participating nations make the first step towards creating indigenous space program by designing, building, testing, launching and operating their first satellites. As Nepal gears up to launch its first nano-satellite-Nepali Sat-1 under project Birds-3 by coming mid-May, we introduce you to two Nepali men who are working hard at day and toiling harder at night in Japan for this project to come to fruition. 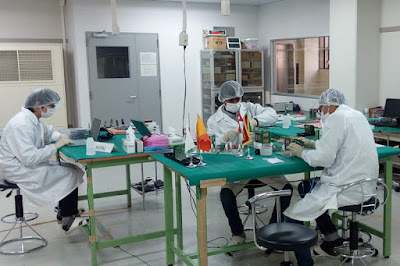 Aawash Maskey and Hareram Shrestha, the former originally from Morang district and the latter from Gorkha, are currently keeping busy with the Birds-3 at Kyushu Institute of Technology (Kyutech) University in Japan with the sole purpose to help Nepal put its own satellites in orbit. Nepal is set to put its own nanosatellite in orbit with the help of these two Nepalis, one completing Master’s Degree in Engineering from Japan and the other pursuing post-doctorate degree there. Maskey, a Ph.D. candidate in space engineering, is leading the Birds-3 project while Shrestha, a graduate from the Pulchowk Engineering College and currently a student of space engineering, is involved in Birds-4. The Nepali nanosatellite, Sri Lanka’s ‘Ravan-1’ and Japan’s Ubishu combined together measure 1,000 cubic centimeters in volume and 4.5 kilograms in weight. Nanosatellite is an artificial satellite with a weight mass between 1 and 10 kilograms. The first-ever Nepal made nanosatellite is scheduled to launch from the USA, said Chief of the technical department of Nepal Academy of Science and Technology (NAST), Rabindra Prasad Dhakal. The three countries simultaneously assembled the satellites and will launch them simultaneously from the USA, according to Dhakal. The Kyutech University has supported in the construction of Nepal’s nanosatellite at subsidized value, informed Dhakal. Shrestha obtained a scholarship for his Master degree in Japan and has been working on Birds-4 while Maskey had left for South Korea to study space science after completing his higher level education in Nepal. After completing 4-years of Bachelors in Space Engineering at Seoul University, Maskey got to participate in a workshop of space engineering. As he came to Nepal a year and a half ago after completing his graduation, he got another opportunity to pursue further studies and work at Kyutech University simultaneously. The Kyutech University had already constructed Birds-1 and Birds-2. After getting through the interview at the Kyutech, he met with Prof Maeda which laid the groundwork for the construction of Birds-3. Prof Maeda had suggested Maskey secure some fund prior to springing into action for Birds-3. Both the professor and research fellow arrived in Nepal to conduct space engineering workshop. After a rigorous process of floating the matter on a space engineering project to the concerned authorities in Nepal and after convincing them, the government finally agreed to fund the Project at the cost of around Rs 20 million which they received in two installments, Maskey’s mother shared. “Aawash wants to come to Nepal to teach other space engineering enthusiasts upon completion of his studies and work in Japan,” informed the proud mother. 32-year-old Shrestha had worked in NAST as a chief technical first class non-gazette officer for 8 years before pursuing his dream with Birds-3 in Japan. After Kyutech University launched Birds-3 project in Nepal, Shrestha got an opportunity to be a part of it. He is currently pursuing his Master’s degree in space engineering in full support of the United Nations. Both the Nepali prodigious students are committed to returning to their country to impart the knowledge on space engineering as well as the efforts being made for Nepali Sat-1 to those willing to learn, grow and contribute to space engineering back home.